This strange computer was designed to be a development system for 6502 based computers. 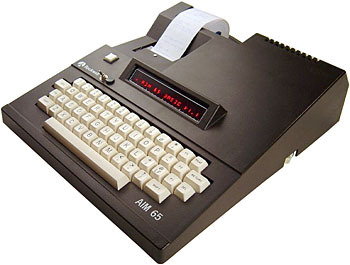 It had no display except for a small 20 character LED screen and a very small thermal printer located directly on the motherboard which could print everything that was typed on the keyboard. The board featured five 4 KB-ROM sockets. Two of them were dedicated to the AIM monitor program, including an instant input assembler (no labels) and a disassembler. Various programming languages (BASIC, FORTH...) or custom applications could be added in the three remaining sockets. Several cards were developped for this machine, especially language cards and ROMs: a BASIC card (BASIC language with floating point mathematics capabilities), PL/65 (a mixture of the PL/1 and Algol languages), Instant Pascal (an interpreted version of Pascal), Assembler and the FORTH programming language. It had 3 function keys, which could be programmed with a jump instruction (assembler). A CRT-Card was also developed for this computer. I was the happy owner of one of those machines. We were a usergroup in Denmark in the late 70' and early 80'. It came with full documentation including as far as I remember 4 books: A complete diagram, a complete hardware manual, a full commented bios listing, users guide and another book. It was one of the first complete microcomputers around. I was on the support team for this system from June 1979 until Jan. 2004. When you mention 'Sound' it made me remember that this system supported the use of two audio cassette recorders for mass storage. It could perform motor control on both. It would read source files from one and write the output to the other. My boss told me that they expected to sell between 400 and 600 of these systems but the number exceeded 50,000. The original target market was embedded designers. Some of these designers actually embedded the AIM into their design. We sold a version without the keyboard, printer, and display, and with only 1k or RAM for $175. The fifth manual Mr. Hertz remembers was the programming guide. When I was hired I was given a complete set of manuals, an AIM 65, and a phone. I tried to answer all of the customer's questions from the manuals before I consulted with the engineering staff. It was a great learning experience. see more Rockwell AIM 65 Ebay auctions !